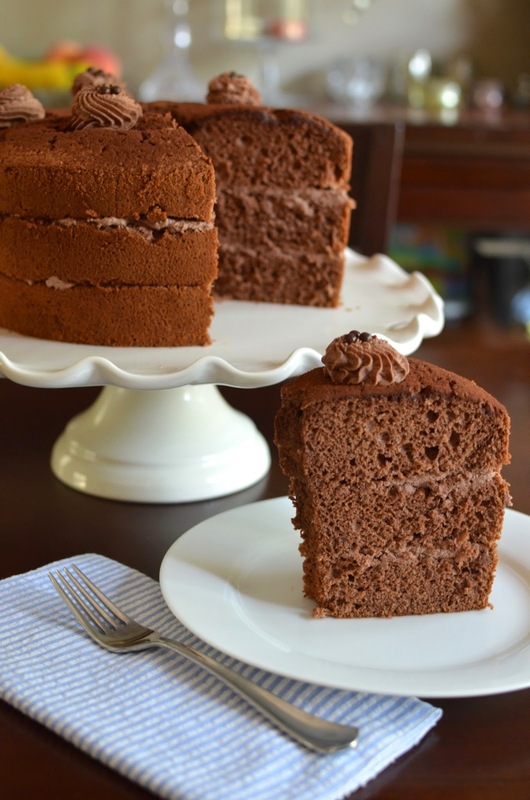 The base recipe for this chocolate chiffon cake comes from Joy of Baking. I made a few changes, including simply using 6 eggs for this cake rather than 6 eggs plus an additional egg white. I didn't think omitting the egg white would make a big difference and I can tell you from my experience that you can keep it simple and just use 6 whole eggs. To be totally specific, I actually used 4 large eggs and 2 extra-large eggs (I usually have both in my fridge). It's a bit random, I know, but I find that with this type of recipe, going with extra-large eggs doesn't hurt and I used a couple of them as extra insurance since I didn't want to bother with that extra egg white (I still haven't figure out a way to keep egg yolks for more than a few hours). My cake puffed and was substantial so go ahead and just use 6 large eggs if you don't have any extra-large ones on hand. Just be sure to fold the batter gently. Investing in a really large rubber spatula is great for folding batter like this. After baking (about 50 minutes in my case), be prepared to set the pan upside down until completely cooled so that the cake doesn't deflate at all. It is quite a big cake! You can see why I decided to slice it into 3 layers. Now I won't go into the obvious about how rustic my cake looks so no one feels the obligation to kindly reassure me other wise. Suffice is to say, I was just glad I got the layers sliced and the cake relatively presentable. More importantly, the end result was a moist, spongy cake with a kiss of chocolate flavor. Chiffon cakes are unassuming but totally reliable. I hope you have an excuse (I mean...occasion) to make a cake real soon! Make cake: Preheat oven to 325 degrees. Have a 10-inch ungreased tube pan ready. In a large bowl, sift cake flour, cocoa, 3/4 cup of the sugar, baking powder, baking soda, and salt together. In a medium-size bowl, whisk egg yolks together with the oil, coffee, and vanilla. Make a well in the center of the dry ingredients. Add wet ingredients and whisk together until smooth. Place egg whites and cream of tartar in the bowl of a stand mixer fitted with the whisk attachment. Beat until soft peaks emerge, then gradually add remaining 3/4 cup of sugar and beat until whites are just stiff and glossy. Using a large rubber spatula, gently fold the egg whites into the batter in 3 increments until just blended. Avoid deflating the batter as much as possible. Pour batter into the ungreased tube can. Run a knife through the batter to eliminate air bubbles and smooth the top. Bake until cake springs back lightly to the touch and a cake tester comes out clean, about 50-60 minutes. Remove cake from the oven and immediately invert the cake (upside down over a cup or large bottle) to cool completely (allow up to 3 hours). Remove the cake by running a sharp knife around the sides of the pan and the center core, angling the knife towards the pan to try to keep the crust intact on the cake. Make cocoa cream filling: Place the cold heavy cream into the bowl of a stand mixer (preferably also cold) fitted with the whisk attachment. Add sugar and cocoa powder and being beating together. Add vanilla extract and continue to beat until stiff peaks. The cake can be covered and refrigerated for up to 4 days. Cut slices and bring to room temperature before serving. Hi Monica, how wonderful you make a cake to celebrate going back to school. You are such a thoughtful mom. Looks delicious! Oh, I'll just take any excuse to make a cake, Cheri...but thank you! haha - thank you so much. The cake looks so soft and airy! Well done, Monica. This looks lovely, Monica! Hope back-to-school is going well for you all! It's very early days yet but so far, so good. Hope things are not too hectic for you! I love that you make a back to school cake! That's such a great tradition! I love the idea of a back to school cake! This looks so fluffy and yummy! Thank you - appreciate it! What an incredible incentive to go to school..you are a great Mom! I love chiffon cakes (actually, I am wondering I there is any cake that I don't like:-)) This one is totally my kind with that height and chocolate in it. Back to School cake? you're an awesome mom! :) and chiffon cake...seriously, is there anything prettier or more delightful? no...no there is not. people don't make chiffon cakes nearly as much as they used to nowadays, and that's a total shame. Love this "naked" cake! Sometimes with all this rich chocolate there's not really a need for extra on the outside. It's perfect as is! Yeah! I almost sound "hip", making a "naked" cake. I didn't even realize - thank you, Joanne. haha. I definitely could go sans icing/frosting/cream but my son thinks everything is better with it. Thank goodness it works here with the chocolate and there's not much. Simple is pretty much all I can do so it's easy for me, Kelly. ; ) You have a wonderful week! I do love how light chiffon cakes are, yet packed with flavor. How Gorgeous...and I've never tried one. Hopefully I'll have a great excuse to make one soon. I think you would love a chiffon cake, Balvinder! There's got to be a happy occasion for cake soon! What a gorgeous, lofty and amazing looking cake! I am dreaming about having it with a huge glass of ice cold milk. It looks so decadent, rich and elegant! Beautiful! What a gorgeous cake! And it's a fun back-to-school tradition for you to have. Ice cream cakes are the best - and any occasion is a good one! I'm not a big fan of angel food cake...I really miss the flavor/richness of the yolks so I'm all about the chiffon. : ) So interesting about making chiffon cakes with matzo cake meal...I have so much to learn! Ohhhhhh YUMMMM!!!! I reallly don't think we need an excuse to make a cake and this cake for sure!!!!!! I'm lovinggggggg how light this looks !!!! The cocoa cream filling sounds absolutely decadent!!!!!!!! I think I need a slice of this cake on a daily basis to keep my sanity intact considering the mountain-load of college assignments I am going to be bombarded with hehehe! Lovely. I love chiffon cakes. They are so light and soft, like a pillow I can sleep on. :P I usually leave my chiffon cake plain, but I like your idea of adding the cream filling. So decadent. I hope you re-visit it. So simple but so good. So lucky to be your child... :D Back to school will bring this chocolate chiffon cake! SO fluffy and delicious. Very tall too! Thanks - it's a nice big cake to make and share.